A Santa Clara County Sheriff's deputy ended up shooting a killing a man they say wouldn't drop his handgun in Saratoga on Monday night, a spokesman for the sheriff's office said. The shooting occurred at 7:49 p.m. off Titus Avenue at Prospect Avenue, according to sheriff's spokesman Lt. James Jensen. That's after deputies had been called out earlier to perform a welfare check at the home, where they had been called out to in the past for undisclosed reasons, he said. "I can confirm there has been a sheriff's deputy involved in a shooting and that standard protocols following these types of incidents are being followed," Jensen said. 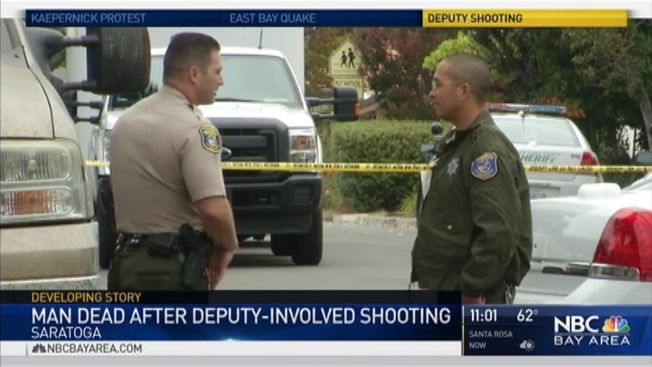 "These types of incidents demonstrate how inherently dangerous the jobs of our deputies are." When deputies arrived, they tried to get inside for 50 minutes. They finally entered the house through the back, Jensen said, and saw a man with a handgun. Jensen did not say whether deputies broke down the door or entered with permission. Jensen said deputies repeatedly told the man to drop his weapon, which they said he didn't. A single veteran officer fired and hit the man, Jensen said. The man was taken to the hospital and was later pronounced dead. It is unclear who exactly the man was, and whether he was the subject of the original welfare call. The last deputy-involved shooting was in March 2015, when two sheriff's deputies on Sweigert Road say a green sedan accelerated and struck a patrol car toward one of them. That's when his colleague fired, hitting the man, but not killing him. Cupertino Union School Supt. Wendy Gudalewicz said she was working with the sheriff's department to try an open the parking lot before school started to make drop-off easier.